One of the most engaging facets of my own graduate career in American Studies, and in working as a cultural/urban geography professor, is when my students and I are involved in interdisciplinary projects that support community partners. All upper-level students in the geography program at my institution complete projects as part of the Columbus Community Geography Center and student work is published there. My upper-level courses have increasingly become focused on a single course project requiring teamwork and a high level of individual preparedness for each class meeting. However, as this project-focused, service-learning-oriented pedagogy developed, I realized that I was not preparing students for this work in my introductory course. Student Profile: Located in west central Georgia, Columbus State University is a public four-year institution with a population of about 7000 students: 65% are full time students and 55% are white, while 32% are African American. First generation college students make up 38% of our incoming class while 48% of first year students are identified as “at risk.” My university is one of three state “access institutions” welcoming students who do not meet regular admissions standards. The larger community of Columbus (population 198,000) has a significantly greater percentage of its citizens who live below the poverty line than both the state and the nation. As a geographer in a teaching-oriented institution with a large teacher-training program, my upper-level classes are primarily service courses populated by history majors with a track in secondary social studies education. I also have geography minors who have developed GIS (Geographical Information Systems) mapping and analytical skills. Student projects are interdisciplinary, drawing on history and geography content and methodologies. Instructional Shift: Over the last twenty years, my introductory classes have developed primarily as a lecture interspersed with questions to test comprehension using individual student response technology. But this instructional mode is mismatched with the need to increase teamwork and the need to support a larger population of at risk students, while also offering sustained higher order and critical thinking. To address this I decided to realign my teaching strategy to require greater individual accountability, more peer teaching and mentoring, and more opportunities to develop critical thinking. Having reviewed a number of classroom flipping strategies I chose team-based learning. Students working in teams peer teaching to understand concepts. Photograph: Eliot Rendelman. 2013. I identify a list of concepts that students are required to review and prepare for each module. This list is shared with students and they are required to review their course readings to prepare for an individual test at the beginning of the class. This helps them focus on particular elements of the reading. In the case of the Russia and the Former Soviet States module, I ask students to prepare concepts related to the political, social, environmental, and economic lives of Russians before and after 1989, such as central planning, oligarchs, point source and non-point source pollution. I develop a series of multiple-choice questions that test students’ readiness to engage with the concepts and this establishes a shared baseline of understanding. Students are given these multiple-choice questions and they respond to each question using individual student response systems. This makes up one-fifth of the student’s final grade. The same questions are posed to teams that I have created that mix student experiences, majors, and expertise. Students engage in peer instruction to answer the questions together and gain an immediate response using a scratch-off Scantron sheet similar to a scratch-off lottery ticket. Assessing the questions each team got wrong, I identify concepts the class did not understand and develop mini lectures to support student understanding. When teams are ready, they are presented an “application” asking them to use the concepts they’ve mastered to analyze a situation. Together teams prepare their “notes” in a Google Drive document during the class period; they are also asked to use the disciplinary citation style. For example, in the Russian module, the application asks students to identify evidence for an article in the university newspaper that answers the question: Are Russians better or worse off than they were in 1989? Having assessed the evidence, teams answer a question. For the Russian module, students are asked: “ Are Russians better off before or after 1989?” They are also asked to identify the most powerful evidence supporting their argument. Teams then share their conclusions with the class and a debate is fostered between teams. Outcomes: After two years of applying this mode of teaching I was ready to compare student grades before and after introducing team-based learning using the class productive grades. The term “productive grade” is used in my institution to define students in a class who receive a “C” or higher grade. The productive grade for spring 2011 class before team-based learning was introduced was 59%. The productive grade for spring 2013—after using team-based learning for four semesters—was 92%. Having developed this teaching strategy in my course class for two years I first used team-based learning in an upper level geography class in spring 2013—a 3000 level cultural geography course. The vast majority of students who took this class had already experienced team-based learning in my introductory course. They were ready for the level of individual preparation for each of my classes. Students were also ready to work together on team projects, and were open to and engage in critical thinking, analysis, and problem solving. Indeed, this spring my history and geography students prepared a 38-page “History from the River” and a map of the newly built rapids that will be used to train the river guides as they take over 30,000 visitors down Columbus’s new, 2.5 mile urban white water course. 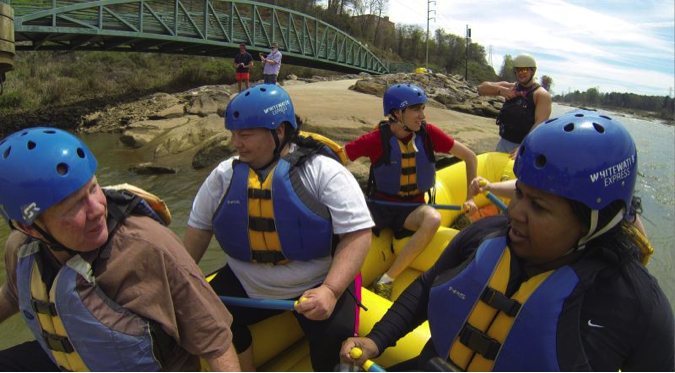 Cultural Geography students taking a whitewater trip as they work to develop a “History from the River” for the whitewater guides; Columbus, GA. Photograph: David Rush. 2014. Amanda Rees is an associate professor of geography at Columbus State University. She received her Ph.D. in American Studies from the University of Kansas (1998) her MA in American Studies from the University of Wyoming and her undergraduate degree in American Studies and Geography at West London Institute. Her recent publications explore historical antecedents to New Urbanism and peer mentoring for early and mid-career female faculty. She is presently working on a book project exploring the production of the American West in the early 20th century through dude ranch tourism.